A portable and comfortable alternative to bulky travel pillows. The Travel Halo cradles the head to allow for rest while traveling and it has a built-in eye mask that can be folded up or down. This works great!! I use it at work when I need to rest my eyes from looking at the computer screen. 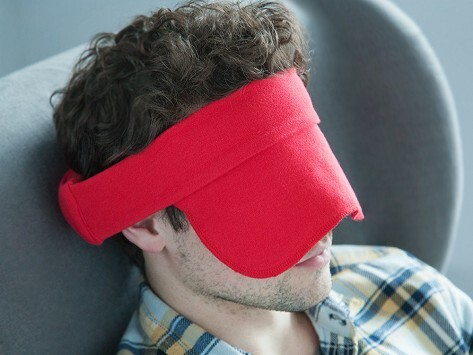 The Travel Halo was designed to help you sleep comfortably while sitting up on planes, trains, or automobiles. It was created by Mike Vahey, a U.S. Army veteran and world traveler, who spent many exhausting, sleepless nights on the road. He found that traditional C-shaped pillows pushed his head forward and crunched his neck. Ouch! Worse, those bulky pillows had to be blown up and were tough to carry, especially with new luggage requirements. Mike wanted to create a different, more effective option. His first prototype was made with tube socks tucked into the back of an eye mask. That original model developed into a patent-pending “halo” with rear stabilizers, positioned between head and backrest. It cradles your skull and aligns your neck, holding them firmly in place. Better still, a fold-down mask blocks light. Small and compact, it fits in its own pouch, perfect in a purse or briefcase. Machine washable, you can keep it fresh for every trip. It's so comfy, you may want to wear it lying down too.